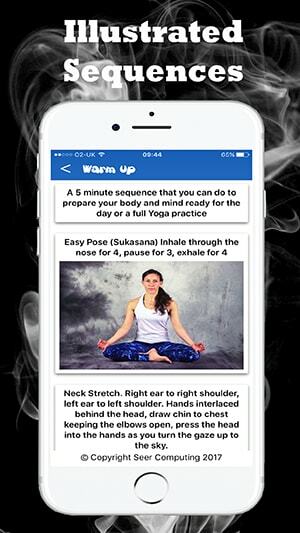 Ana Chidzoy is an accomplished Yoga tutor based in Swansea, South Wales and amongst other things presents daily 'Hotpod' courses throughout the region. The first section for each posture, immediately following the image is the 'Basic' area, here Ann breaks down the pose, how to get in it, how long to stay in the posture and importantly what Yoga posture to use to transition into it. Also if there is an alternative posture to this one, perhaps for yogis with a particular strain at present or if the level of this posture is advanced. The next section is a little more personal, Ana gives her personal views regarding how she feels whilst holding the pose, giving insight into the pose's benefits and advantages. 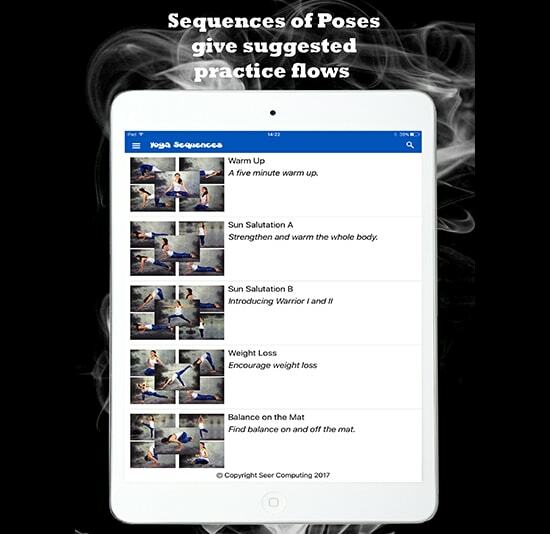 Later on this webpage we'll talk about the other sections in the App where we split the postures up into their degrees of difficulty and the areas of our bodies which benefit most from the posture. 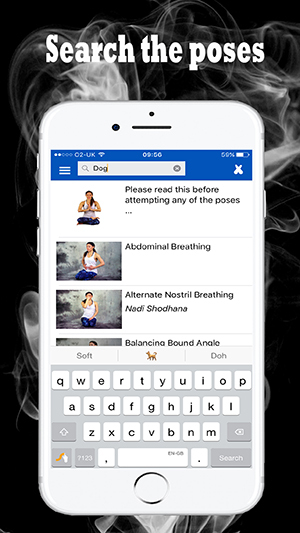 The above sections are followed by the Contraindications area, a lot of attention should be paid to this section, Ana lists all medical conditions which would preclude using this pose within your practice. 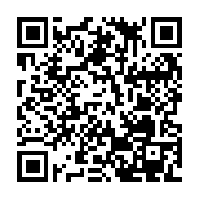 Please don’t attempt any posture until you read this thoroughly. All in all there are over 150 postures all of them laid out in the above format. Aside from the main area listing all of the postures, the poses are split into sub-groups outlining the area posture benefits the most such as chest, balance etc. 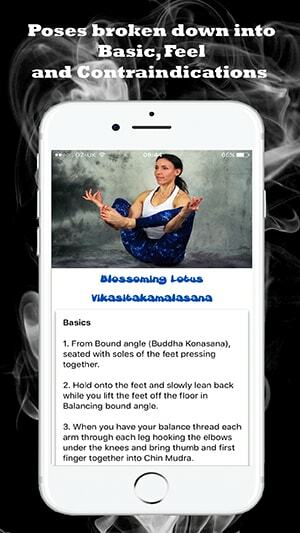 All poses have both their English and Sanskrit names and can be ordered by either, in addition, the poses are split into sub-groups outlining the areas they concentrate on such as Chest, Balance etc. ... Obviously there will be a bit of overlap because some Yoga postures benefit a number of different areas but they are repeated where necessary. There is also another section which gives the Sanskrit name for the posture as well as the English name. 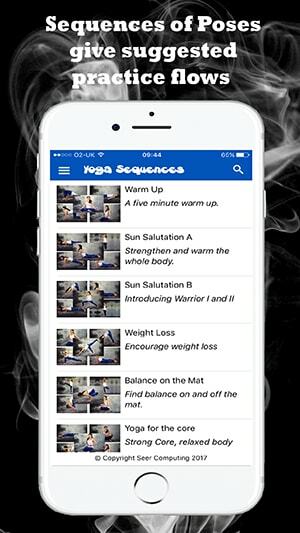 Finally in yet another section, Ana has prepared seven sets of Sequences, linking together Yoga poses which help your practice, these range from Warm Up to Weight Loss and can be scrolled through and followed during your practice. 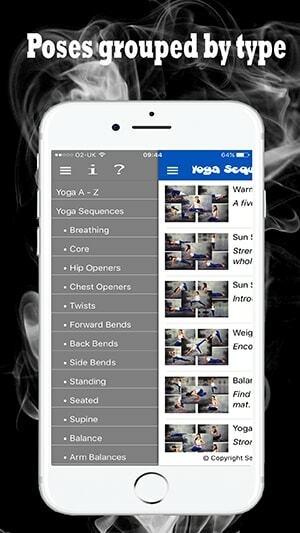 Now some words about the App itself, the Yoga A-Z app is available for both Android and Apple platforms, is usable on all screens from small smartphone up to tablet/iPad, it works in both portrait and landscape orientation. 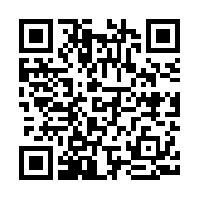 Seer Computing is looking for other teachers who have similar skills to Ana, perhaps you teach Tai Chi, perhaps you are a massage teacher, we would love to produce a collaborative App with you, we have a number currently in production, speak to us to discuss how we can make it happen. 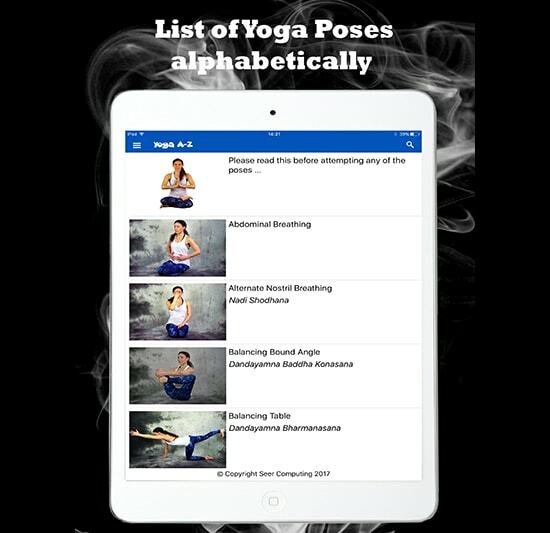 In the meantime, download the Yoga A-Z app and enjoy. Namaste.